To be buying my new laptop this weekend. It's the MacBook Pro. I did a lot of research and this one seems to be the one that will work best with me. I am still mourning the loss of my old computer though. To be taking the kids to Texas Roadhouse today. Check out your local one, many are doing a special Kids Night for Halloween where the kids can wear their costumes and do crafts. Last year there was a giant armadillo dressed up. That amused me. To hope that we don't pass out all the Halloween candy. I'll take those Milky War bars for myself, thanks. To have made a Red Baron pizza yesterday for dinner. I got tired of cooking. Since Tom has been home I've tried to always have a nice meal but yesterday I was like, "No more cooking!" To love the pumpkin shakes from Godiva. They are amazing. To also love the pumpkin cheesecake from The Cheesecake Factory. I love that place. We went there for lunch and yum. To have a giveaway for an interesting book called League of Denial here. To think it's awesome that Natalie loves sharks. She's always been fascinated by them. She might be girly, but she loves Jaws. Yay for MacBook Pro and Texas Roadhouse!! I also love Godiva drinks... haven't had one in a couple years now lol. 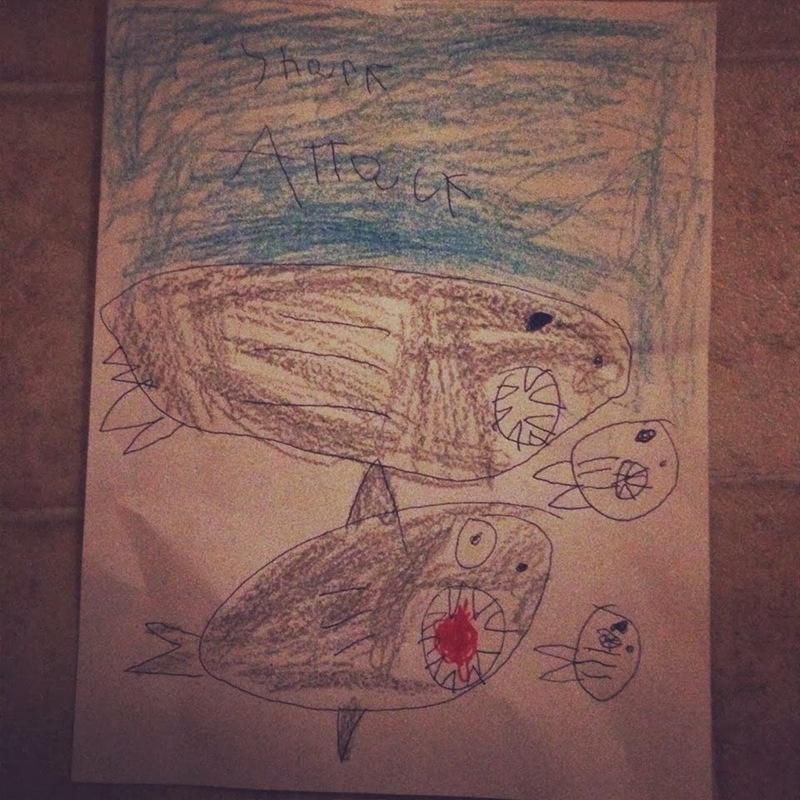 Natalie draws a good shark! 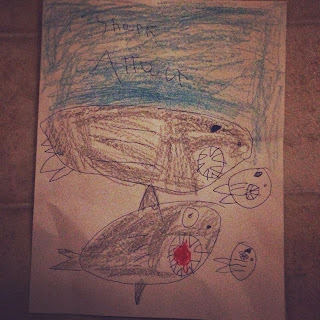 Yes, I LOVE sharks and it started when I was a young kid. Also, you will love the Mac I bet, mourning the old or not. Also, even though I'm a grown up and I can buy myself three bags of candy if I want, I still have the same desires to have leftovers from Halloween. It's like... found candy or something. It's actually my favorite movie...right up there with Urban Cowboy. Hey, it's ok that I'm going to the Renaissance Festival and dressing up in full gear this weekend! Now I really wish I had some rolls from Texas Roadhouse!! Texas Roadhouse, Cheesecake Factory and Milky Way bars...all things we don't have in Canada! Now you've got my mouth watering for a pumpkin cheesecake! Thanks! I'm so with you on the halloween candy! Hope you enjoy the new computer. I bet you are loving that macbook pro right about now! Change is always hard but you will learn to love the new one. I have a hard time with passing out candy too-I want it all to myself!! !